In June 2011, scenes from the Batman film The Dark Knight Rises were being filmed at Wollaton Hall in Nottingham. 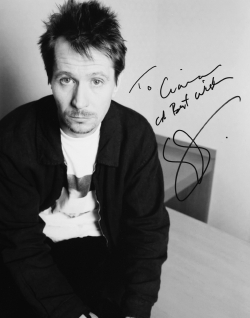 I went along to the hotel where some of the cast were staying, and was thrilled to meet Gary Oldman there. Gary signed a photograph for me and then I had this photograph taken with him. much older sisters, who helped to look after him after their father died. One of his sisters, Maureen, is the Eastenders actress Laila Morse. He took on various jobs to make ends meet - hospital porter, shoe salesman and abbatoir worker - before applying to RADA. He was rejected by them but later won a scholarship to Bruford College of Speech and Drama in Kent, graduating in 1979 with a BA in Theatre Arts. Oldman then spent about eight years doing theatre, gaining a lot of stage experience in rep at York, Colchester and Glasgow before a six month run of the play Summit Conference (1982) at the Lyric Theatre in London's West End. and gay writer Joe Orton in Prick Up Your Ears (1987) which brought Oldman huge public recognition, and paved the way for a whole host of starring roles in the 1990s. Two years later, He starred with Joely Richardson in Heading Home (1991), an elegant production which evokes the atmosphere of England in the 1950s. regarded as one of Oldman's all-time best film performances, indeed he himself has been quoted as saying that it was his own favourite performance. 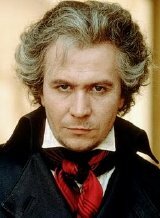 pimp Drexl Spivey in True Romance (1993) and the deaf composer Ludwig van Beethoven in Immortal Beloved (1994), a superb film in which Oldman gave an outstanding performance. 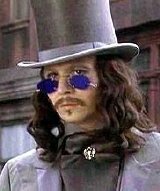 sadistic prison warder at Alcatraz, in Murder in the First (1995), Gary Oldman played a completely different role, a Quaker pastor, in 17th Century Massachusetts Bay colony romance The Scarlet Letter (1995) co-starring Demi Moore. In the Oscar-nominated Air Force One (1997), Oldman plays a terrorist, Ivan Korshunov, leader of a gang of Russians who take over the plane carrying the US President. In the same year, Oldman, playing the inter-stellar arms dealer Zorg, co-starred with Bruce Willis in the weird sci-fi fantasy The Fifth Element (1997), much of which was filmed at the Albert R Broccoli 007 Stage at Pinewood Studios in England. Winona Ryder at a time when his marriage to Uma Thurman was in trouble. produced epic, was filmed on location in Morocco & Malta. kill Hannibal Lecter. Horrific stuff!! Phoenix (2007) and Harry Potter and the Deathly Hallows: Part 2 (2011). 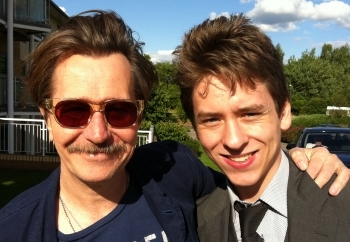 Of his role in the Harry Potter films Gary Oldman said, "I've done so much R-rated work, it's nice to have a job you can show your kids!" The Joker. The third film in the series The Dark Knight Rises, is due for release in 2012. Book of Eli (2010), with Gary Oldman playing the villainous town leader Carnegie, has been received much better, and has been nominated for a number of awards. Guinness in the 1979 BBC TV serialisation of the novel. Smiley is an espionage expert who is forced out of retirement to find a Soviet mole that lurks within MI6. 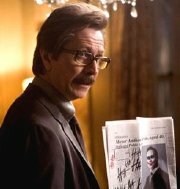 how chameleon-like Gary Oldman is, as each of his characters is completely different to any from his previous films. a rehab program in 1995. Oldman actually met his ex-wife, Donya Fiorentino, at an Alcoholics Anonymous meeting. beyond the 'Nomination' stage. He did, though, receive a Screen Actors Guild (SAG) Award on behalf of the late Heath Ledger in 2009, after being asked to do so by the Ledger family.